Jews have a history of not only promoting but practicing illegal immigration. 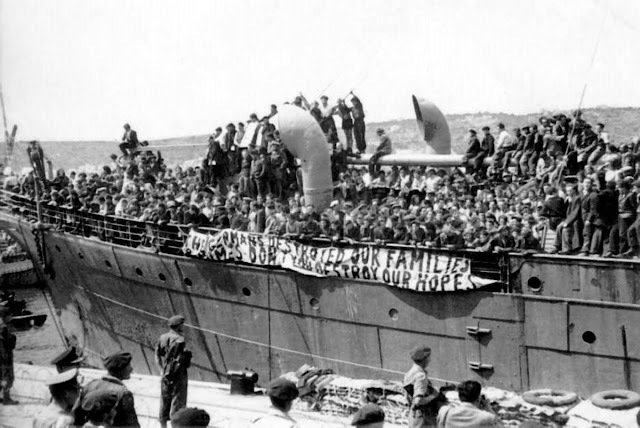 Above, a boatload of Jewish would-be illegal immigrants play the Holocaust pity-card as they demand illegal entry into Palestine, 1948. There is also a history of Jewish illegal immigration to the United States that extends to the present day and is a factor in the attitudes of many Jews toward DACA. Read more about the Jewish relationship to illegal immigration here. If the Jews know that mass-deportation is a crime against humanity, and Israel has begun deporting Negroes en masse, what do we call its policy? Hypocrisy? Lying? Crime against humanity? Well, Israel has always been about crime and "humanity" certainly doesn't include -- in its perspective -- the Palestinians, the Negroes in Israel, the White race in America . . . This article is a helpful bit of writing, helping the reader to see how illegal immigration's progress in America is a ballooning symptom of the fear to admit the Holocaust is as fake as a three dollar bill and the refusal to admit the truth is causing a moral cancer throughout America.